When I was doing my PhD, a bunch of my friends (mostly Biblical Studies PhDs) read a book called The Bible Made Impossible by Christian Smith. Smith’s major thrust — from what I recall — was that evangelicals read the Bible as though it is perfectly clear and has one meaning when, in fact, it is possessed of polyvalence, as any glance at the many volumes available at your local Christian bookstore would make clear. I don’t remember if he had a solution internal to evangelicalism or not. On a related note, Smith himself had converted to Roman Catholicism because, in part, of this issue. In the Roman Church, the Magisterium can help you navigate the polyvalence of Scripture. I don’t think one needs to convert to the Church of Rome in order to address this problem. Moreover, I suspect that many people who go to Rome seeking authority and absolutes are converting for the wrong reasons, given the fact that the Magisterium leaves many awkward questions unanswered, and a great many Roman Catholics are in open rebellion against the Magisterium on many issues, and priests occasionally utter heresy in the confessional. This is not to characterise all converts to Rome, of course. Some, I suspect, though. That is to say — you need more than a desire for absolutes if you want to swim the Tiber, because you’ll find fewer than you expect. Anyway, I am reading Henri de Lubac’s Medieval Exegesis, and here we meet the polyvalence of Scripture head-on. What marks the late antique and medieval approach to polyvalence is the authors’ extreme comfort with it. Time and again, from St Augustine of Hippo onwards, so long as an interpretation does not undermine the Catholic faith, and so long as it builds up charity to God and/or neighbour, any interpretation is a go. Some of them may be more factually correct, of course. St Jerome, as I recall, is a big fan of at least producing factual and logically valid options, even if multiple ones exist. Some are also to be preferred because they strengthen the Catholic faith more than others. Moreover, not only are pre-modern exegetes totally comfortable with polyvalence, they expect it and revel in it. Scripture has been given to us as a way for God to reveal Himself to us. God is infinite. Therefore, we should not be surprised that His self-revelation is itself potentially infinite in its interpretation. Furthermore, different people and different times have different needs and different questions. The inexhaustibility of Scripture means that it can and will produce meanings that will help its various readers. I recall first meeting ideas like this in Augustine’s Confessions, where he talks about Genesis and how any logically valid interpretation that builds up charity is allowable. It was something of a breath of fresh air after the years I spent in the interminable (at times ridiculous) creation-evolution debate. Here was the greatest theologian of Latin Christianity saying that, in Genesis 1, there is no one right answer. And he himself was espousing allegory, of all things! St Augustine, the great propagator of predestination! So if you’re starting to find the Bible impossible, one pathway to recovery is finding those exegetes who came before western Christendom fractured at the Reformation. Take their inisights alongside those of modern scholars and seek the infinite God in His infinite variety. And he himself was espousing allegory, of all things! St Augustine, the great propagator of predestination! Eh? What does predestination have to do with it? I see that the logical connection was left out. Moderns who allegorise Genesis tend to do so with the result of cutting out the Fall or original sin, and thus rendering predestination null and void. Thanks for the explanation. I see the connection now, albeit not a necessary one. Origen is perhaps famous for espousing allegorical interpretations and polyvalence of the Scripture. Predestination would fit within his interpretive framework as well. But as if, in all the instances of this covering (i.e., of this history), the logical connection and order of the law had been preserved, we would not certainly believe, when thus possessing the meaning of Scripture in a continuous series, that anything else was contained in it save what was indicated on the surface; so for that reason divine wisdom took care that certain stumbling-blocks, or interruptions, to the historical meaning should take place, by the intro­duction into the midst (of the narrative) of certain impossibilities and incongruities; that in this way the very interruption of the narrative might, as by the interposition of a bolt, present an obstacle to the reader, whereby he might refuse to acknowledge the way which conducts to the ordinary meaning; and being thus excluded and debarred from it, we might be recalled to the beginning of another way, in order that, by entering upon a narrow path, and passing to a loftier and more sublime road, he might lay open the immense breadth of divine wisdom. One of the theologians I’ve recently enjoyed is Tim Mackie with The Bible Project. 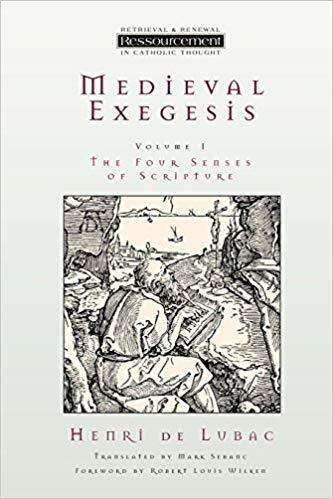 He approaches Scripture without denominational sway and is very interesting in explaining the ancient/original reader’s mindsets for us modern & westerners. I’d be curious your thoughts on his work.